We understand that the holiday season can be hectic, but it is very important that you take a moment and read through our 4Q Newsletter. It includes 2017 Pricing updates, how to upgrade to HTTPS://, updating your Responsive Acorn Design to support Google's latest changes, NEW Inn Owner Basic education and so much more including the Latest Breaking News you need to be aware of that can impact your business. Google has recommended that all websites be hosted on secure HTTPS:// servers because they want the data being transferred online to be encrypted. A placement boost has been suggested. Moving to an HTTPS:// server resolves your tracking issues with TripAdvisor and Google Analytics, that were introduced back in the Spring of this year when TripAdvisor moved to an HTTPS:// server. We are now requiring HTTPS:// as part of any new Responsive Design Site Go-Live. If you are already hosting with Acorn IS and would like to have your site upgraded to an HTTPS:// secure server, please complete the request form below. Calling all Innkeepers who have Acorn IS Responsive Designs, your action is needed! Google is at it again, or maybe I should say still. We first noticed this most recent change regarding Schema code happening the week of Thanksgiving. We have verified that Google has updated the Schema markup for the Local Business group to now require "Image" and recommend "Price Range". This change impacts your Website code, and we need your approval to install the changes, as there is a minimum charge to do so. Please click the Learn More button below to read the full blog post, and to complete the Approval Form listed at the end of the post in order to have these changes applied to your existing Responsive site. Starting in 2017, we are excited to announce that we are adding a new educational track to Acorn University especially designed for Inn Owners who are not interested in doing DIY marketing, are new to the industry, or just need a refresher course on today’s online requirements. We are calling this new track Inn Owner Basics. The new track will include 2 short (20 minute +/-) webinars a month to help Inn Owners get up to speed on the basics they need to know to run their inn, effectively, online. We see Innkeepers every day continue to struggle with the basics of their Domain Registration, understanding the difference between PPC, Local and Organic, the importance of their online Business Identity, what E-Commerce is and why you need it, and the list goes on and on. This understanding of online basics is a very real need in our industry. Innkeepers who don’t understand the basics are the ones that tend to make mistakes, simply because they didn’t know what they needed to know. If you missed our Free-For-All Webinar on November 30th, "The Secret of Your Online Success", please contact Annie Buck at annie@acorn-is.com or 719-219-6732 to receive access to the video so that you may take the 10 Question Owner Quiz. If you miss more than one or two questions, you need to seriously consider joining Acorn U and begin learning the basics of your online responsibilities. We are designing these Inn Owner Basics webinars to help you eliminate these sometimes costly, but very real mistakes. These sessions will be recorded for you to watch at your convenience if you cannot attend live. And you’ll also have access to all of Acorn University for your Inn staff to attend, should you wish to have them learn how to DIY any of the marketing tasks for you, or simply to help you successfully manage your online requirements. In Acorn University, they’ll how to do it right the first time, saving their time and your money. And if you are already hiring out your marketing work to a Marketing Firm, then this is the one and only foundation you’ll need to keep track of the work your Marketing Firm is doing for you, as you too will receive the Project Management guide, to monitor your marketing progress. And for all our dedicated hard working DIYers, don’t worry, we’ll still be teaching all of our HOW TO classes, including Club 60, our 3rd Tuesday Q&A sessions and providing our Project Management Guide as we always have! Whether you are interested in the Inn Owner Basics Track or the original Acorn University DIY Track, or you’d like to pick and choose the classes from each of the tracks you want to learn more about, it all is covered in one yearly low price. Finally, if you were part of Acorn University throughout 2016, your yearly fee for 2017 will automatically appear on your January 1st invoice. Don’t wait. It’s time to get in the know and improve your online skills. Contact Annie Buck our Education and Local Manager at annie@acorn-is.com or 719-219-6732. We are proud to announce that we are now providing a 60+ page printed “New Owner” Ultimate Handbook to your buyer after closing. Please keep click the "I'm Selling" link below and complete the form so that our Sales Manager is able to stay in the loop as you approach your official closing date. This will allow us to be of assistance with the hand-off of your Website and all associated services from you to your new buyer. We will also be able to provide them with our new amazing handbook to help them gather all the data they’ll need to work with you to obtain after closing. Are you a new owner, within the past 12 months (+/-), who has recently decided to work with Acorn Internet Services, or perhaps you just purchased a property where the previous owner employed Acorn Internet Services as their Web Services Provider? We'd love to send you a copy of the "New Owner" Ultimate Handbook at no charge. If you are currently an Acorn client, and would like to have a copy of this valuable information, please complete the form below! …will continue to receive the 5% Pre-Pay savings into 2017. Not on Pre-Pay but would like to be? Contact Annie Buck at annie@acorn-is.com or 719-219-6732 to start saving now! • WordPress Updates - WP updates have been $10 a month since 2013. Due to the amount of WP mandatory security updates required per year, this cost is going up $5 a month. Don’t understand the IMPORTANCE of paying for Quality Online Hosting Company? 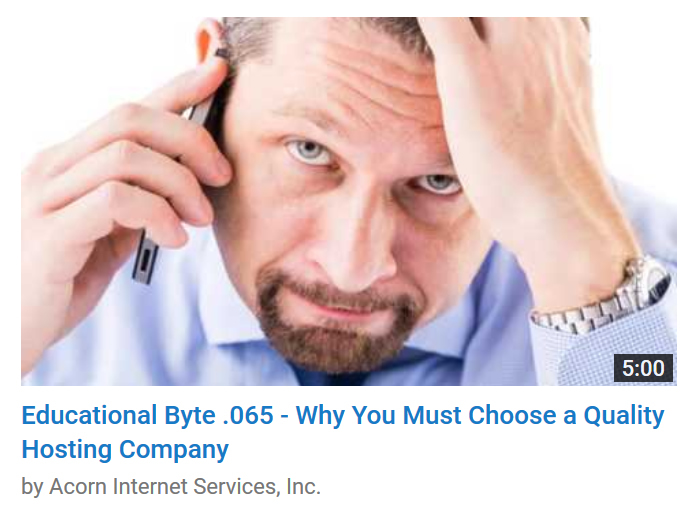 Take 5 minutes and watch the video below to learn why choosing a quality Hosting Company is so very important! New Responsive Design pricing will be adjusting in 2017 to support the additional work that is required for your Website to be Google compliant. Google changes their algorithms on a daily basis and some of these changes affect the way we develop our website designs. These changes require additional effort and time to ensure the highest possible placement in Google, your number one provider of online website bookings. As that Google has recently announced their new Mobile First changes, you will want to make sure you have moved to a Responsive Design ASAP, so now is the time to get your deposit in on a new Responsive Website, and you can still pay 2016 pricing through December 31st, 2016, even if the site goes live in 2017. Need more information? Contact Tammy Doriot at sales@acorn-is.com or 877-226-7699 to learn more. We are updating our Acorn Internet Services Company Website to include a new Innkeeper testimonials section where you can share your words of wisdom with other Innkeepers. Many of our clients have been using our services for over a decade, and we want to be able to share your thoughts on how we have helped you grow your business with the upcoming generation of Innkeepers. If you'd like to join the other Innkeepers already sharing their Acorn Experiences, please click below, we'd love to post your helpful feedback online! By doing so, we'll be providing your website a quality in-bound link for Google to see from our Acorn IS website.